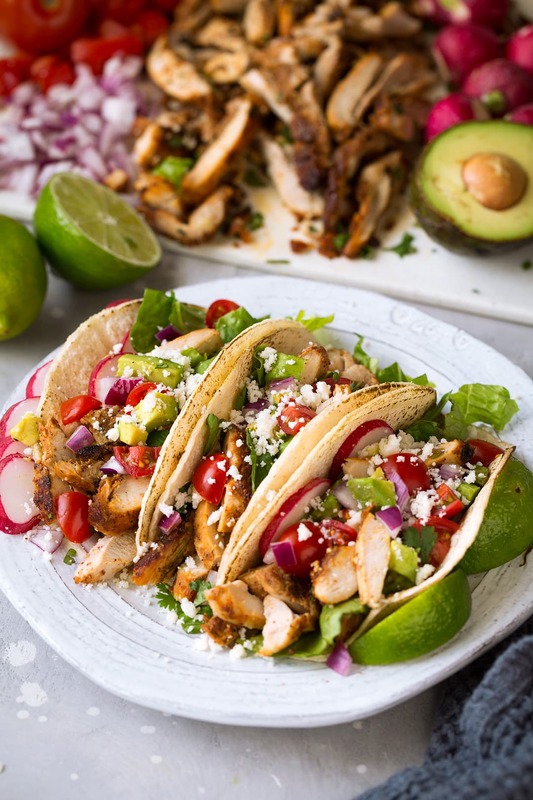 Oven Roasted Chicken Tacos are the epitome of perfect weeknight dinner! 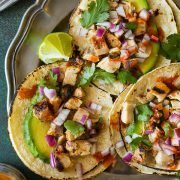 Even though the chicken isn’t grilled these are still the some of the best chicken tacos – thanks to that marinade and high oven temperature (a dark pan will help too). I have the feeling these will be a regular on your dinner menu! A Must Have Chicken Taco Recipe! You could just go street taco style and use chicken, onion and cilantro but I say bring on alllll those toppings! I love to load tacos up with lots of fresh ingredients. We all know tacos are way better with tomatoes or pico, avocado or guacamole, cheese (monterey jack, queso fresco, cotija, etc), radishes, lettuce, sour cream or Mexican cream, and lots of hot sauce. I mean you don’t need everything there but I like to add at least 3 of those. So a few recipes inspired this one, my Grilled Chicken Street Tacos and this Oven Roasted Chicken Shawarma that I shared. It’s a very similar flavor to those street tacos but the method is the same as that shawarma. Because who wants to grill when it’s 20 degrees outside? For this recipe I do recommend using a dark coated baking sheet, it really does help the chicken brown better so you get a bit of a char flavor to it. These are the ones I have that you can buy on Amazon HERE. Whisk together olive oil, lime juice, garlic, spices, salt and pepper. Place chicken in a gallon size resealable bag, pour olive oil mixture over chicken. Add cilantro then seal bag while pressing out excess air. Rub marinade over chicken. Refrigerate 1- 6 hours. Preheat oven to 425 degrees. Grease baking sheet with 1 Tbsp olive oil. Remove chicken from marinade and transfer to baking sheet. Roast in preheated oven cooked through, about 30 – 40 minutes. Let chicken rest 2 minutes then cut into small strips or cubes. Serve in tortillas with desired toppings. And now we can enjoy delicious chicken tacos 365 days a year thanks to this simple marinade and oven roasting method. That marinade is really what makes these tacos so good. It’s a blend of olive oil and fresh lime juice, some Mexican spices, and fresh garlic and cilantro. It turns boring chicken into something so flavorful. 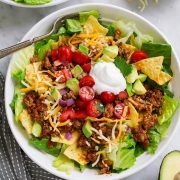 Everyone will love these tacos! Chicken breasts could be used too but they won’t be as good (note that they won’t need to bake as long). The thighs are more tender, have more flavor and moisture and the fat in them helps the edges crispen up and brown better. Even if you don’t normally like thighs try them here, trust they’re perfect here! 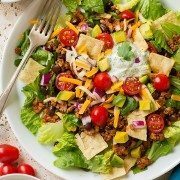 More Delicious Taco Recipes to Try! These easy Oven Roasted Chicken Tacos are the epitome of perfect weeknight dinner! 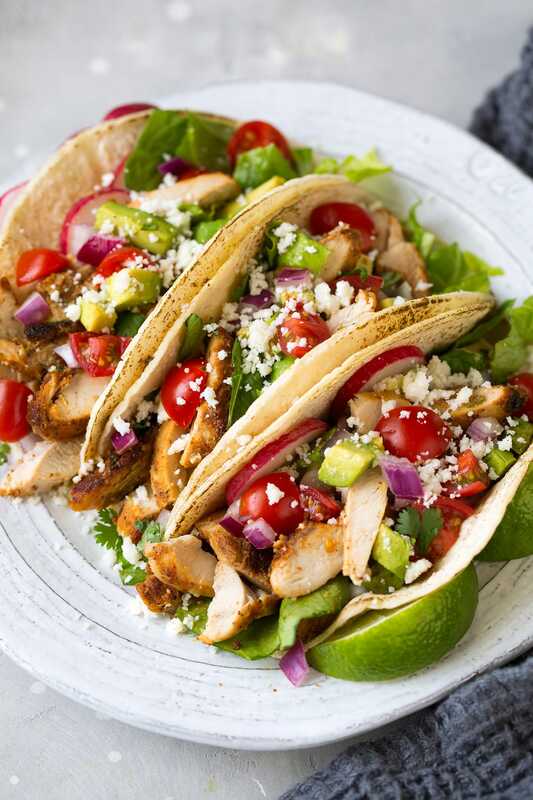 Even though the chicken isn't grilled these are still the some of the best chicken tacos - thanks to that marinade and high oven temperature (a dark sheet pan will help too). In a mixing bowl or liquid measuring cup whisk together olive oil, lime juice, garlic, chili powder, cumin, coriander, cayenne pepper, salt and pepper. Place chicken in a gallon size resealable bag, pour olive oil mixture over chicken. Add cilantro then seal bag while pressing out excess air. Rub marinade over chicken well. Transfer to refrigerator and allow to marinate at least 1 hour and up to 6 hours. Preheat oven to 425 degrees. Brush a rimmed (preferably dark coated) 18 by 13-inch baking sheet with 1 Tbsp olive oil. 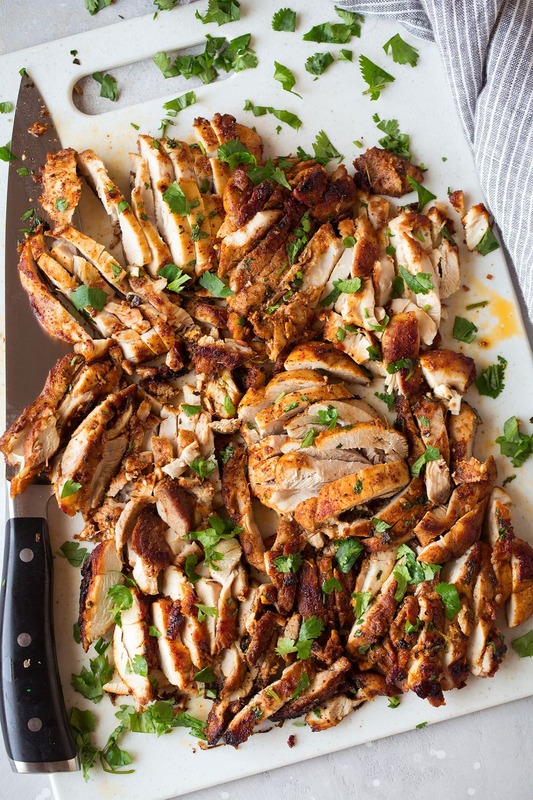 Remove chicken from marinade and transfer to baking sheet spacing chicken evenly apart. Roast in preheated oven until bottom side is golden brown and crisp and chicken is cooked through, about 30 - 40 minutes. Let chicken rest 2 minutes then cut into small strips or cubes. Serve in tortillas with desired toppings. Toppings not included in nutritional info. 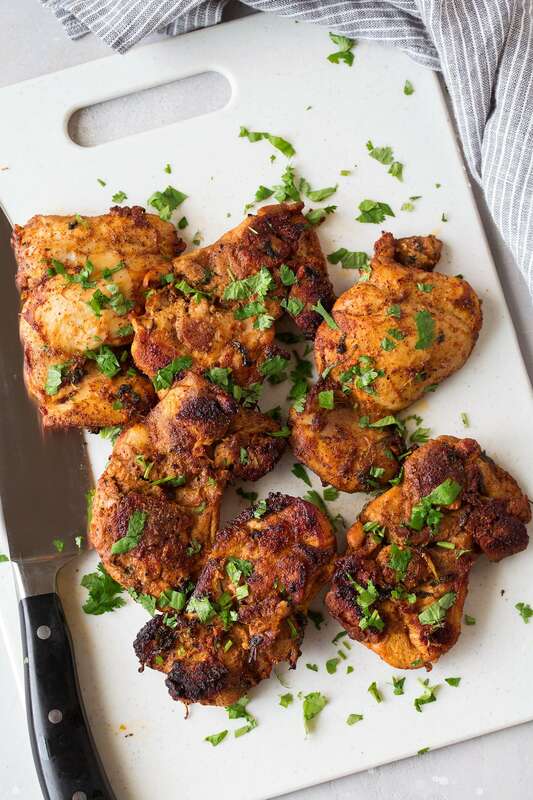 Jaclyn: I would recommend sticking with the thighs here, they brown better and have more flavor. I didn’t used to like thighs but now I’m sold for recipes like so. And with acidic marinades I just don’t like to leave them in too long because it can start to break down the meat a little and change the texture but you might just be fine with a day.